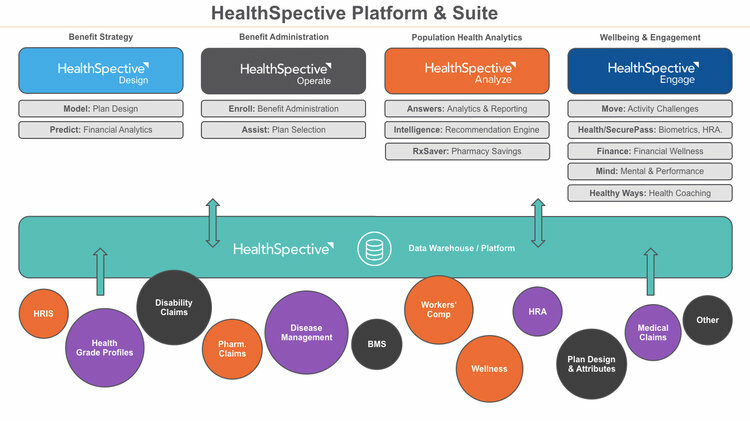 The HealthSpective Data Warehouse integrates data from all vendors and sources related to employee health, for application across all four of the platform’s modules — Design (benefits design and strategy), Operate (administration), Analyze (data analysis), and Engage (employee wellbeing and engagement). HealthSpective operates under a single sign-on, with integrated dashboards that give plan administrators a centralized home from which to retrieve and analyze all data related to health benefits and outcomes. All of the information in HealthSpective’s Data Warehouse, including benefits and employee data, is hosted in a private cloud that is audited to meet SOC-2 (as defined by the AICPA) and HIPAA requirements. While serving as a repository for all of the company’s health benefit data, HealthSpective’s Data Warehouse gives you control over the data you own, while improving your ability to evaluate, manage, and change vendors as your business needs evolve. Build benefits plans that optimize spending and maximize utilization. Get greater access into each step and every area of your plans and programs for better administration. Understand the entirety of your population’s health and health spending to optimize your investment solutions. Leverage our specialized application for fitness, individual health profiles, and financial and mental health.